Elva Mae Nearing Meredith left her earthly home after a 48 year struggle with multiple sclerosis on June 23, 2018 at Edgewood Spring Creek Manor Assisted Living in American Falls, ID. 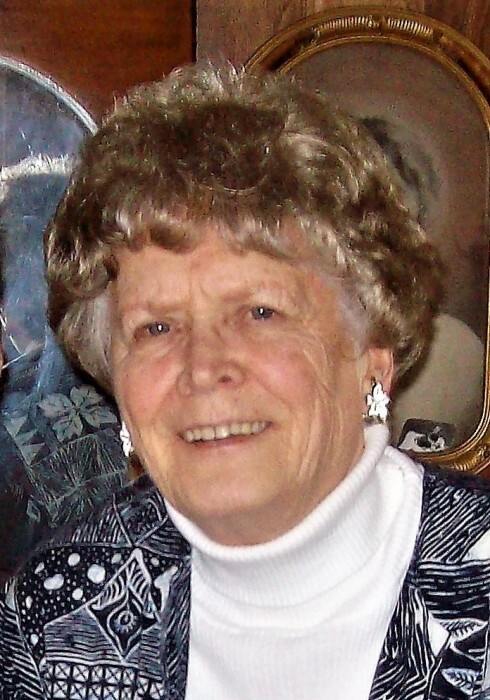 Elva was born December 30, 1929 to Bill and Mae Nearing in Kellogg, Idaho. She was the 6th of 12 children, one sister passing away at birth. Although Elva was very timid and bashful as a child, she had a tender heart, desire to excel, and unparalleled work ethic. This motivated her to have a goal to graduate from high school, and she was the first of her siblings to achieve this accomplishment. After high school she became a cook at a mining camp in Page, Idaho where she had lived throughout her childhood. It was there she met her sweetheart, Gordon Meredith. They married February 23, 1949 in Coeur d’Alene, ID. After a short time, they moved to southern California, where they became members of The Church of Jesus Christ of Latter-day Saints and were later sealed as a family to their daughter Karen Marie and son William (Bill) Gordon, for time and all eternity in the Los Angeles Temple. Elva and Gordon moved to Rexburg, ID to care for their granddaughters Stephanie and Kim, while their mother, Karen worked. While there they started Sunbeam Daycare and Pre-School, which they operated until her health forced their retirement. They loved the children they cared for and were affectionally known as Granny and Grandpa. Elva was also a licensed cosmetologist. Mom had a love for dog’s and had many loving companions throughout her life. Her granddaughter, Kim, bought her recent dog, Maddie, and brought her to mom the day of her husband’s funeral. She often said Maddie was the sweetest dog she ever had. She loved her and worried for her until the end. Elva is survived by her daughter, Karen (Dan) Hammond of American Falls, her brothers Richard (Sandra) Nearing and Jerry (Pat) Nearing of Pinehurst, ID, 11 grandchildren, and 54 great grandchildren, whom she loved with all of her heart. She was preceded in death by her son Bill, and husband Gordon which took a piece of her heart and altered her forever, along with her parents Bill and Mae and siblings Maxine, Mary, Jenny, Bruce, Bill, Pearl, Bucko, and Deannie. Although she lost the use of her arms and legs, her heart was bigger than ever and her patience in the face of extreme suffering was a blessing to all that knew her. We would like to thank her caregivers from Edgewood Spring Creek and Heritage Hospice for their love and attention. There will be a viewing Saturday, June 30th, from 11:30-12:45 with the funeral service at 1:00 at 111 Church Place, American Falls, ID. Burial will be in the Falls View Cemetery in American Falls.